I have had this flavor combo in my head for months. I kept buying goat cheese with the intention of making this flatbread but it would get used up for everything but this. Finally, I had some down time on Sunday afternoon and decided I couldn't avoid it any longer. I have to admit I got impatient with my flatbread. I didn't let it get as crispy as intended, but it tasted delicious all the same. I have to remind myself that sometimes you need to just leave food alone and let it do its thing for a minute. I can already tell this will be a recipe I modify over and over. The blueberries and balsamic made a really nice spread that could easily be paired with a lot of other flavors. A soft cheese is a necessary base but don't feel limited to using goat cheese. If you're looking to save time and can't bake the flatbread yourself, just use a pre-made pizza crust or even toasted lavash bread. In a large bowl combine yeast and water and let stand for a few minutes. Add flour and salt to the water mix and stir until a ball begins to form. Sprinkle flour on your hands and turn the dough onto a lightly floured surface. Knead the dough until smooth, adding extra flour as needed, up to 1/4 cup. Place the dough in a bowl with cooking spray, coating the entire round. Cover and let rise for 1 hour. Preheat oven to 475°. Turn dough once more onto a lightly floured surface and roll into a thin rectangle shape. Place the dough on a baking sheet and drizzle olive oil on top. Bake for 10 minutes, until the crust is golden and crispy. 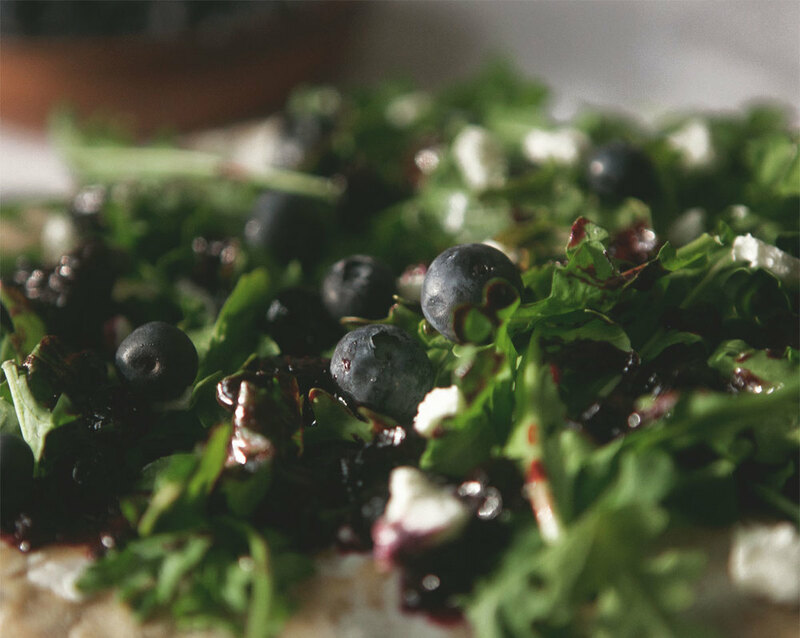 While the flatbread bakes, combine one cup of blueberries with balsamic in a skillet over medium heat. Stir frequently until the mixture thickens and becomes bubbly, about 3-4 minutes. As soon as the flatbread comes out of the oven, coat with a layer of goat cheese, followed by arugula and blueberry sauce. Top with more goat cheese, blueberries and balsamic to your liking. Serve immediately.